A neighbor's horse farm on a hazy morning. The late September air seems to urge us to get busy. Only a couple of days ago, we awoke to a temperature of 38 degrees...it felt as if the chill of winter was approaching. On went the flannel sheets, a hard look was taken at the stack of wood in the barn, and plans were discussed on how to best keep the chickens and bees warm this winter. Some mornings have been hazy, veiling the roads and landscape on our early-morning drive to school. The farm fields surrounding us have grown shaggy as corn and beans dry out, and yesterday, the first combines appeared to gather the harvest. Last week our own garden was put to bed for a long winter's rest. Well, all of it except for the pepper plants (Why are they more prolific now than they have been all summer?) and the kids' garden patches, which are still blooming with cosmos, zinnias, 8-foot sunflowers, cantaloupe, and watermelon. Apples have been turned into applesauce, peaches are now peach jam, and pears were eaten right away! Our first fruit tree harvest was small, but what a joy to pick fruit from our own trees. The pace of summer is winding down, and we've found ourselves "putting by" as our grandmothers would say. Roasting tomatoes into spaghetti sauce, transforming apples into apple butter, digging potatoes, and preparing to make grape jam. The pace of summer has slackened some, but harvest time has a busyness all its own. It seems we're not the only ones preparing ourselves for the cold...bees are bringing in the last of the pollen from asters and goldenrod flowers, there are fewer eggs to be found on our trips to the hen house, and even our yellow tabby, Azreal, can be found sunning himself late into the day, as if he too, feels the warm days of soaking up the sun are numbered. And truly, these changes are just fine with me. Autumn is my favorite season, and as the woodsmoke-tinged air becomes cooler, we'll enjoy mugs of chocolaty cocoa and s'mores around the bonfire as we savor the changing of seasons. Here's a recipe that just couldn't be easier. We used Yellow Transparent apples from our tree, but any good cooking apple will be just fine. Combine all ingredients; stir well to blend. Place in a slow cooker. Cook on low setting for 8 to 10 hours, or high setting for 3 to 4 hours. A snapshot of the garden's variety of peppers...the colors seemed oh-so pretty together, especially that pop from the purple bell pepper. The garden bounty is winding down...it's a bittersweet time. 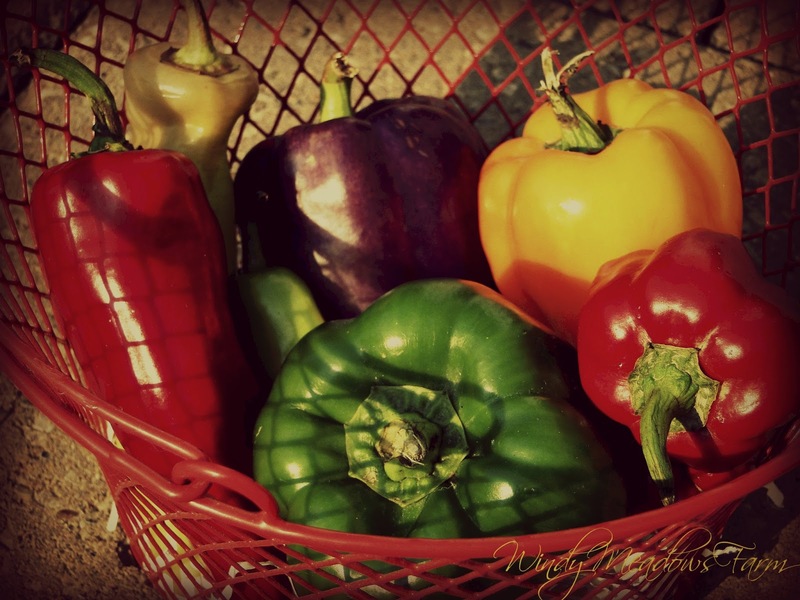 And while I love the crispness of fall and all the color it brings, I'll certainly miss the savory taste of sun-warmed tomatoes, sweet, juicy peaches, and the vivid colors found in the pepper patch. to listen, to behold, to love. first one by one, and the myriads that no man can count, and lo! and you and I are here."